This bowl symbolizes the coming together of family and community. 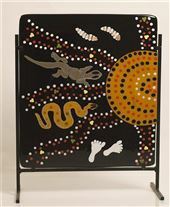 John Beck – renowned Aboriginal Artist, has kindly allowed me to use his icons on glass from his brilliant canvases, so together we can communicate the story of the Dreamtime of his creative ancestors in this exhibition in a unique way. 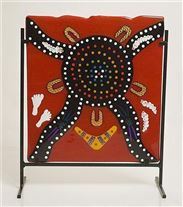 According to Aboriginal belief, all life as it is today – Human, Animal, Bird and Fish is part of one vast unchanging network of relationships which can be traced to the great spirit ancestors of the Dreamtime. This bowl is a “one only” and will not be repeated. 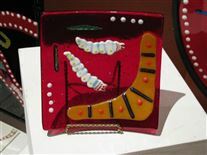 John Beck our renowned Aboriginal artist, tells me this is all about the Hunter and his people! How the Hunter shares his meal with his group at the Meeting Place. It shows the tracks the folks make as they head towards the meeting place. Once again, it is all about Community and being together, maintaining their law and customs and knowledge for survival and attachment to their land. 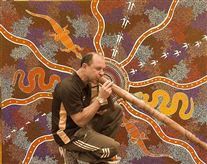 Aboriginal music also plays a strong role in their culture and Aboriginal “sing their country” in ceremony that combines song dance and art. 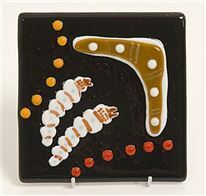 Thanks goes to John Beck for allowing me to use his symbols in my Glasswork – together we are able to communicate the story of a proud indigenous Community. 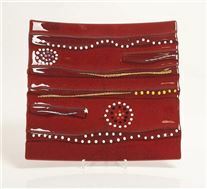 This Red Opal Platter has an amazing see through quality! This time I have taken a more modern approach to our Aboriginal tracking their way across the land to their Meeting Places. This Red Opal Piece has an amazing see through quality! A delightful panel that comes with its own stand to let the light flood through, or can be removed and affixed to the wall. 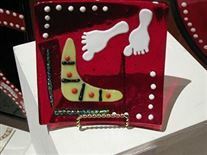 The “C” shaped symbols in this piece represent the people who are coming together to share a meal. You can see the tracks along with the witchetty grubs and quandongs which no doubt will provide good bush tucker for those who get together. Here they will share their stories along with the Hunter represented by the feet of the hunter. 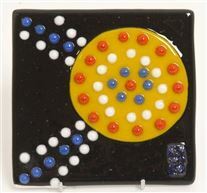 Inspired by the renowned Aboriginal Artist John Beck who has kindly allowed me to use his symbols in my glasswork. 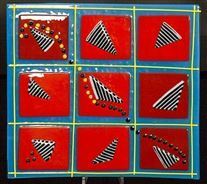 Crafted in rich Black glass, this square panel shows the coming together of the community at the waterhole! This is where stories have been passed down from generation to generation. The renowned Aboriginal Artist John Beck who has kindly granted me permission to use his symbols from his paintings, employs dots on dots, concentric circles and curved and straight lines. All have multiple meanings depending upon their context. Despite this there are some standard design elements. Concentric circles usually represent campsites or rock holes. Straight lines between circles illustrate the routes travelled between camps or places. “Wavy lines “across a painting is usually water or rain. A small "U" shaped figure represents people sitting and straight lines next to them are weapons or domestic implements. Tracks, whether human or animal, are often depicted in plain view as they appear on the ground. Lizards and snakes are frequently shown as one would see them from above. “The Goanna lives in the plains or sandhill habitats. It is like the Perentie but called the Goanna, but the Goanna is smaller than the Perentie and they have different patterns on their skin. 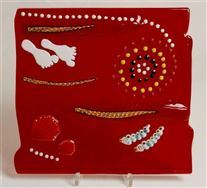 "Walking Together" - Large Ochre Square Platter. This textural piece just invites you to run your hands over this dish. 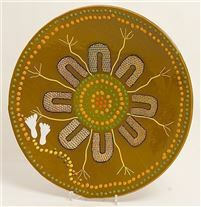 Crafted in the ochre colours of the desert this platter depicts several people walking together with the Hunter. This is the time when the Elders teach the younger members of the group. They tell them of The Dreaming and the journeys and deeds of creator ancestors. How they made the trees, rocks, waterholes, rivers, and mountains . How their spirits inhabit these features of the natural world today and stars, as well as the animals and plants. The Elders who play such an important role in the community, teach them what is good and what is bad through these stories. 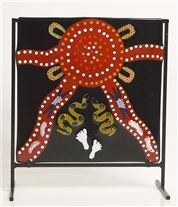 John Beck’s canvases which are my inspiration, is a descendant of the mirrning and murlba people. 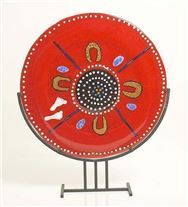 Ochre 56cm Bowl.-"Storytelling At The Meeting Place"
As Aborigines had no written language, their religion was regenerated with paintings, stories, song poetry and ceremonies. Storytelling at a Meeting Place was so very important for our Aboriginal people. This bowl shows the feet of the Hunter – he would have many stories to tell the community – to teach, to share with other young men in the group. 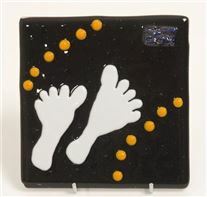 Most Aboriginal people believe that all life as we know it today (human, animal, or plant) is part of a vast and complex single network of relationships which can be traced directly back to the great spirit ancestors of the Dreamtime. 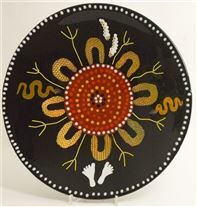 In the Aboriginal world view, every event leaves a record in the land. Everything in the natural world is a result of the actions of the metaphysical beings whose actions created the world. 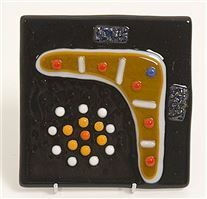 This piece signifies the coming together of the Indigenous Australians from the Red Centre with its changing colours and gradually forming a bond with the multicultural Australians that have made this country their home. 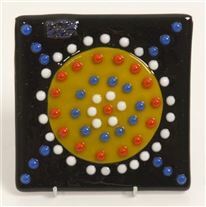 This is my tribute to modern aboriginal art. 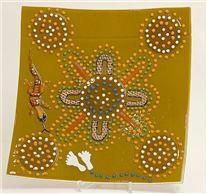 A wet substance similar to papier mache, is placed on the ground dot by dot by our indigenous people– and when modern artists used acrylic paint on canvas and board with brushes, many imitated this process. It became a trademark, and many followed. My application is glass on glass rather than paint on glass and I just wanted to include it as part of our Australian Landscape. John Beck is an amazing Indigenous Artist. 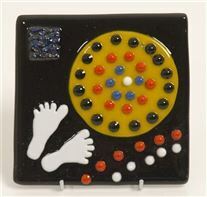 John asked me to create some glass pieces that reflected his Aboriginal Canvases.